This was my first book by Meghan Quinn. I know I’m late to the party again. She has been gaining a lot of followers lately. I was pleasantly surprised! Emma is a force of nature. She is strong, compassionate, sassy, and so full of life that when she’s suddenly finds herself evicted she doesn’t let it put a damper on her life or the last semester of nursing school. Tucker has been dealt a difficult hand from the moment he was born. He hasn’t let that stop him in his pursuit to make something of himself. He has however let past situations impact his dating life or lack thereof. Tucker and Emma are old friends. They grew up together, share a history, and unfortunately some heartbreaking times. Once Tucker hears that Emma’s in need of a place to stay. He doesn’t hesitate to offer her a place to stay. Now this is where the fun beings and sparks start to fly! I don’t want to ruin the story for you so make sure you one-click this book. 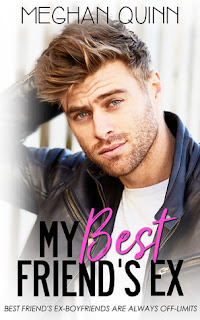 I enjoyed My Best Friends Ex but at times it felt like the story was dragging and a bit to wordy. Emma and Tuckers characters had amazing chemistry and you could feel their sparks igniting. Thanks for review Terri. I too have not read this author yet, so I appreciate your review!